It's hard to define the style of The Cloud. Sometimes, it's electro-rock; sometimes it's more focused on just electronic music; sometimes it's electronic hip hop. As you can see, it's always electronic-based. 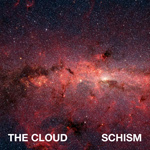 In the case of the three-song EP, Schism, it's the electronic hip hop that's being utilized. And Toronto native and genius behind the music Andrew Huang does it exceptionally. Schism gets off to a fantastic start with a gem called "Peacemaker." The music is rather haunting and contains a beautiful synthetic backdrop and heavy bass line. Huang sports an air-tight flow with creative lyrics. It takes a few satirical jabs at our money-hungry society, like "I know you cut wages on your slaves so docile so you can have a raise and spend it up at the brothel," and "you wanna be a billionaire so freakin' bad, step on anyone to get rich, a milli in the bank and you've got no time for your kids." He also briefly mentions his faith earlier on in the song ("walk on water and turn that water into wine if I follow in the footsteps of Jesus"). "Once More" follows, bringing a more poppy vibe along with it. The synth is irresistable and Huang actually sings the hook instead of rapping it. He spends his time recalling when he met a girl, saying "If I could do it once more, baby you know I'd still know how to sweep you off the floor, and I don't mean like a chore, but I really cleaned up my act 'cause I adored you." But later in the song, it seems to be more about losing the girl, when he talks about messing up and hurting her. The short EP closes with the short "Caustic." It's another no-hook hip hop track like "Peacemaker," but his flow is a bit slower. He doesn't seem to be talking about anything specific in "Caustic," rather just taking some time to flex his skill. I guess the best way to define The Cloud is unique. Going through their discography, you'll get a lot of sounds. All of them are good, though, with Schism being one of the best, despite its short length. It's only $1.99 on The Cloud's Bandcamp, which is a great deal. Schism is a great EP and only makes me appreciate his music all the more. Huang is always dropping new music, so be on the lookout for more all the time.